Once upon a time the daddy of this distribution, Klaus Knopper, started a trend with his pioneering Knoppix live CD as rescue and repair tool. It was known for incorporating extensive hardware detection that required minimal to no configuration at boot to arrive at a fully working desktop. Nowadays nearly every Linux based project also has a live CD or hybrid live and install image to offer, and Knoppix has been out of the limelight for a while. It's still around though and has some unique points to offer, as I'm about to find out in this review of Knoppix 6.7, which was recently released to the world on 3rd August 2011 with the 2.6.39.3 kernel. As a heavily KDE leaning distribution Knoppix was also one of the first to ship with KDE 4 when it debuted, where it allowed for an early view of things to come. The DVD came with a variety of desktops including GNOME, Fluxbox and IceWM which could be enabled through entering cheat codes at the boot prompt. 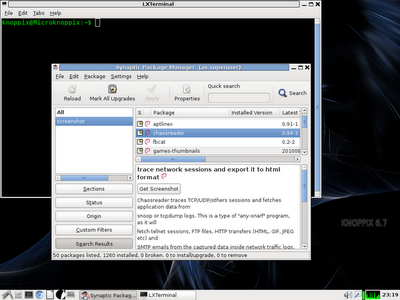 These days, ever since 6.0 was released, LXDE has become the default on the CD, with more environments and window managers available on the DVD. Besides, Klaus Knopper also issues special versions to coincide with the annual CeBIT and LinuxTag expos and conventions, so there are usually three releases a year to keep the system up to date with the ever changing requirements of hardware detection. As if this wasn't enough he also does a specialist version called "Adriane" live CD which is aimed at assisting blind and visually impaired people. As per Wikipedia it can be used entirely without vision oriented output devices and is a backronym for "Audio Desktop Reference Implementation And Networking Environment". Now you know. All are available in either English or German language download versions, so you have six different variations for each release. 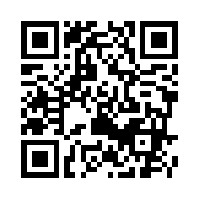 The website is also in English and in German. Together with his training and consulting activities the man must be busy. His distribution has also spawned a fair share of derivatives of its own, for example DSL (Damn Small Linux), Overclockix or Knoppix STD (for Security Tools Distribution) to name a few of the more interesting ones, although most have been discontinued or have moved on to another base. 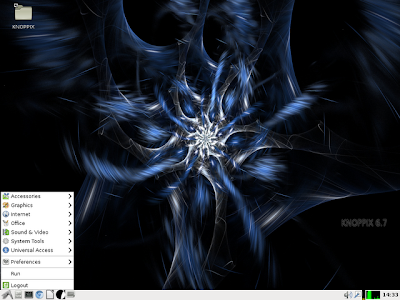 Knoppix is of course based on Debian, and was once the original Debian-based live CD. While some releases are based on the latest Debian stable, depending on timing, as we move away and stable is becoming outdated newer ones are a mix of packages from Debian testing and unstable branches with stable and an updated kernel. Does this alone sound like an interesting combination? Knoppix is still a 32-bit i486 only system, but an optional 64-bit kernel can be enabled via 'knoppix64' boot option. Read the release notes for 6.7 here or find download links to all but the "Adriane" version here. Alternatively, find links to mirrors and torrent trackers for all versions including "Adriane" on this page. After this introduction, let's move on to Knoppix 6.7. I prefer CD size if available and downloaded the English speaking version of the "Adriane" live image as well as the regular one to compare, both standing at 697 MB. There doesn't seem to be too much difference at all. This month's Linux-Magazine, where the creator has a regular Q&A section, also comes with the full Knoppix DVD version if you prefer, as the image is a hefty 3,816 MB which apparently equates to a heavily compressed 9 GB of software. That should be more than most people could ever want. As most of the time, the test machine is an Acer Aspire 5551 laptop with AMD HD 4250 Graphics, a Phenom X3 @ 2100 MHz, 4GB of ram and Broadcom chips for networking. As the shell will tell you, Knoppix since 6.0 is built on Microknoppix, a "complete rewrite of the boot process" with multiple tasks run in parallel, and it results in quite a fast boot even from optical media as I found out. I started with "Adriane" live from CD and, oh my, half way through the boot process got stuck in a blank screen. My first chance to delve into those cheat codes, which you can access by hitting F2 at the boot prompt, and after choosing ACPI=off was on my merry way to the desktop. Moving over to try the same in a virtual machine booted the image smoothly and showed me that utilizing the cheat code must have somehow disabled the screenreader and skipped the menu selection that you get in the "Adriane" version to choose from different services. These entries all lead to cli oriented programs like mutt for emailing, which makes sense for visually impaired users, and applications can be navigated between with the Esc key or alternatively 'q' to bring you back to the main menu. A bit further down under Setup several entries allow to configure a network connection, set up a printer among other things, add a braille device from a long list and even start installing Knoppix to hard drive or flash disk, all supposedly without using your hands if you have a microphone set up. Color me impressed, I really think I should have tried this earlier. And it may be good for those days where you're lazy to type, too. At this point I tried the standard Knoppix CD and found that the only difference is that in the "Adriane" version this desktop is already enabled at boot, whereas in standard it is third in the boot options menu, after Knoppix64, when entering cheat code mode. Apart from this the two images are identical, which explains the size. Right, so I should have made it adriane ACPI=off instead of knoppix ACPI=off at my previous attempt. Watch out for those bear traps, people! Finally, you can also get access to graphical programs from within the menu, where you can choose from starting LibreOffice with ORCA screen reader (here still identifying as soffice/openoffice, that's how old the entry is) which launches the office suite in full screen, starting the Chromium browser with screenreader or starting the LXDE desktop with screenreader enabled. This is the part where you get the cool "Initiating startup sequence" message spoken by a soft female voice that's been part of Knoppix forever. Sort of makes you feel like on your very own personal space odyssey. Exiting one will bring you back to the main "Adriane" menu. I have to say this worked well, with the system reading out different screen sizes to me in LXrandr, and it was easy to follow and understand accoustically. The real test is of course being able to operate applications and complete your tasks all by voice, which I did not take the time to test here. Perhaps in another series of articles comparing the accessibility features of Knoppix, Vinux and Windows one day. Unfortunately the virtual keyboard xvkbd refused to close every time I tried it out over several new boots, but that was the only such problem encountered. Graphical effects were a bit of a let down though. When trying several Knoppix 5.x releases years ago on my old Thinkpad T42 all the Compiz bling was working fine, both in LXDE and in KDE 4. I was unable to get this to work on my current hardware, even after making sure to start or restart Compiz and playing with the settings. The desktop felt amazingly quick and responsive, not a surprise considering it is built on Debian 6.0.2 with a light weight desktop and few running by default. Suspending worked sort of, but left me with a black screen after coming back up with no choice but to restart, so no, not on my hardware. Connections are handled by the Network-Manager nm-applet. Unfortunately neither my Huawei Vodafone modem stick nor my internal Broadcom were supported. No network whatsoever. The Knoppix live CD is based around the Light weight desktop environment LXDE, so you get the usual applications that are part of it, i.e. Leafpad as simple editor, PCmanFM for file management, LXterminal etc. You find an interesting choice of GTK+ software bundled which is mostly known from the GNOME or Xfce desktops. Under Accessories you find Gpicview as a light picture file viewer, Xarchiver for compressing and extracting which sadly does not integrate with this file manager as it does with Thunar, Xournal for taking hand written notes. In the Graphics section we get the GIMP, the GNU Image Manipulation Program, Xpdf for reading those office formats, Xsane, a graphical front end for image scanning, and of course LibreOffice Draw which is present together with the entire LibreOffice suite 3.3.3. Sound and Video sports the Brasero disk burner, the GNOME interface to Mplayer for video and audio (no jukebox a la Exaile or Audacious), Aumix to tweak those levels of volume and balance, and Daisy player, a command line CD player that will exit of it does not detect a CD in a drive. The System Tools section provides the GNOME configuration editor Gconf, Htop, and with HardInfo a system profiling and benchmarking tool that provides fine grained information on all your hardware and loaded kernel modules for example as well as being capable of running several benchmark tests on the CPU simulating Blowfish encryption and others. Wine is also installed by default to extend the choice of applications users will be able to run from the get go. Not a bad choice if you're looking at it from a functionality perspective instead of an ideological one, and it doesn't mean one has to use it. You'll find the accessibility tools already talked about earlier under Universal Access. Perhaps the most interesting one is the Preferences section that is housing a plethora of options, some of which might fit better under System Tools. Here you find access to Compiz configuration and settings, a tool to add a cellphone or PDA, an IP traffic monitor, opportunities to set up printers via the CUPs web interface, ISDN connections or start a firewall with the help of the crude but effective KNOPPIX firewall script. Another scripts starts an SSH server via sudo, and of course GParted is available for partitioning needs. Being essentially Debian Knoppix is also using the Synaptic package manager from where you can install more programs, but there's also another custom script to add some packages via the install components option (lower case). This one allows to add exactly five programs: Amarok, Audacity, Kaffeine, MS core fonts and the Adobe flash plugin. I have no idea why these receive special treatment, perhaps it is to guarantee the latest version or to get the full multimedia experience similar to providing a codec installer. It would be interesting to see if this is also in the German version where certain legal restrictions do not apply. Most multimedia codecs are already provided though, like the Gstreamer sets and Ffmpeg. I was able to watch H264 and Ogg video, no Flash unless it is first pulled in. Java is installed in the shape of the free OpenJDK alternative. Finally, we can also find basic installers for hard drive and flash disk here. They look rough but they work, as already seen in the past. Knoppix has a rudimentary hard drive installer. It basically only gives you three options: launch Gparted to partition manually, let Knoppix use the entire hard drive or auto partition. I was unable to find an option to assign mount points and leave some of your partitions untouched. This is clearly not desirable if you already have important systems on there, and I decided not to tempt fate. Once upon a time I had a Knoppix 5 DVD installed and know that the installer does its basic job ok, which means it copies over the entire image to your hard drive and sets up a boot loader. Knoppix is clearly not meant to be installed to hard drive as your main OS. On the other hand, the install to Flash drive script seems slightly more polished and even includes a graphic. Again, it basically allows you to partition the drive and then dumps the contents of the CD/DVD on it. This is, with the option of enabling persistent storage if wanted, probably the preferred way to run it. You can even have persistent storage if running from optical media in the shape of a compressed image on a partition. Knoppix will scan available storage on boot up for a persistent home directory, or one can be specified with home=/dev/sdaX/knoppix.img. Updating the package list with Synaptic showed that the sources are in the main pointing to repositories in Germany, and depending where you are it might be a good idea to edit them to use servers closer to you. Knoppix isn't the most beautiful distribution. Actually, that's an understatement, but it's not what it's concerned about and never was. In fact the wallpaper is the only nod to visual appearance and style. It is still an utterly utilitarian distribution with many qualities, including tools to aid accessibility for visually impaired or otherwise disabled users, network and system administration, and rescue and repair tasks. In contrast to earlier versions KDE 4 applications are now notably absent from the CD, and where an earlier 6.0 that was built on Debian 5 "Lenny" still excelled at multimedia, Broadcom wireless and Compiz the current 6.7 is based on Debian 6 "Squeeze", which has taken a different stance on firmware inclusion. It seems Knoppix has followed this to a certain extent and some functionality has regressed in order to keep up with Debian philosophy. Adobe Flash for example used to be part of the default. Or it could just be my hardware. Some of the problems I encountered may already be solved by updates as I noticed queued updates for acpi, acpi-support and the broadcom-sta kernel modules. In any case, this is still a great distribution to carry on a USB stick, just don't expect too much bling and use it as it was intended, to get stuff done. And if you got the space, the DVD offers everything but the kitchen sink. Find some screenshots of 6.4 with cool hackerish wallpaper here, or download my text file with Knoppix cheat codes. Also, while writing this Knoppix 6.7.1 has just come out, the first update to use the 3.0 Linux kernel. I think you meant "Knoppix is clearly MEANT to be installed to hard drive as your main (only)OS. @AnonymousAgreed.I installed the dvd version,and it installs just about all you need while you you go about your business - no time consuming browsing over individual package selection,but still able to add anything extra from Debian if necessary.As for the 9GB space requirement,I didn't know you could buy a hard drive with less than five times as much as that,for cripes sake.And who these days can afford a PC who can't afford a dvd drive. Yup, that's another way of looking at it. Might as well use it as your only system, just not multi-boot friendly. Would you be as kind as not to spam this blog? I seem to have crossed the threshold where this blog is becoming interesting for spammers. Have had a lot such comments in recent weeks. Content has been removed. Thank you for your support! I have 8 varieties of PC bought over last 5 years and Knoppix 6.7 worked perfectly well on all of them. I am not sure what the author is complaining about. Please try the Knoppix support forum, www.knoppix.net/forum/, another page with helpful links I would suggest is at http://www.knopper.net/knoppix-links/ with support links in many more languages. You can also try good old Linuxquestions.org where people can help you with most distributions. It´s all Linux after all.